DAMASCUS (Reuters) - The Syrian government hopes dialogue with Syrian Kurdish groups will intensify, a minister said on Sunday, signaling support for talks the Kurds hope will lead to a political deal between two of the main players in the multi-sided war. The Kurds have sought Russian meditation for the talks with President Bashar al-Assad's government, part of their strategy to fill a vacuum that will be left when U.S. forces withdraw from the country, as instructed by President Donald Trump. Their aim is to guard against any invasion by neighboring Turkey, which views the main Syrian Kurdish group - the YPG - as a national security threat, and to preserve autonomy in northern Syria. "We hope for the intensification of the dialogue. 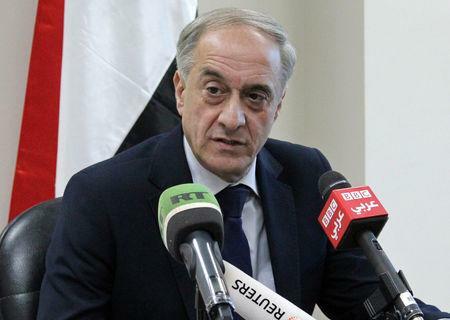 Many of the Kurdish statements were positive regarding their concern for the unity of Syria," Assistant Syrian Foreign Minister Ayman Sousan told a small group of journalists in Damascus. "We are confident that through dialogue we can deal with some of the demands ... and this dialogue guarantees that, as long as it based on a commitment to Syria's unity." A political deal could piece back together the two biggest chunks of a country splintered by eight years of war, leaving one corner of the northwest in the hands of anti-Assad rebels backed by Turkey - an adversary of both the YPG and Damascus. Damascus has previously stated its opposition to the kind of federal state sought by the main Kurdish groups. A Kurdish politician told Reuters earlier this month that the leadership of northern Syria had presented Russia with a road map for a deal and would pursue one regardless of U.S. plans. Sousan said intensified dialogue was important when set against challenges, "especially the expansionist ambitions that lead the policies of the Turkish regime". Russia said on Friday it was important for Syria's Kurds and government to start talking in light of U.S. plans. Trump's decision to withdraw troops has been clouded by mixed messages from Washington since it was abruptly announced last month, catching off guard allies including the Kurdish-led Syrian Democratic Forces militia. The U.S.-led coalition said on Friday it had started the pullout process, but officials later clarified that only equipment, not troops, were being withdrawn. Turkey views the YPG as an extension of the Kurdistan Workers' Party (PKK), which has waged a 34-year insurgency in Turkey, and aims to crush its foothold in Syria. U.S. Secretary of State Mike Pompeo said on Saturday he was optimistic that a "good outcome" could be reached between Turkey and Syrian Kurdish groups, after speaking to the Turkish foreign minister.